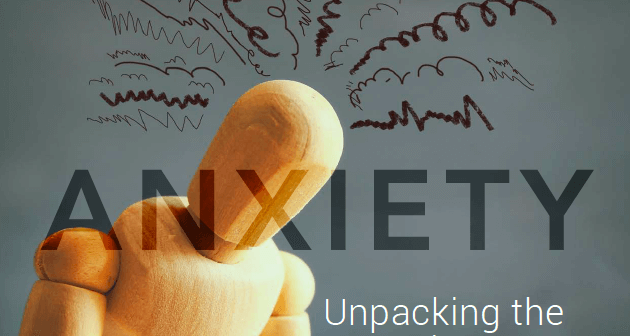 Just keeping up in our fast-paced, interconnected world is a challenge, so it’s not surprising that anxiety has reached epidemic proportions in modern society. However, the causes of anxiety are not all environmental and the long-term use of antidepressants can often be avoided, writes Dr Sly Nedic. Anxiety is the new depression, with more than half of all college students reporting its presence, according to latest epidemiological studies in the US. Social media has forever changed how we interact and perceive reality, and perhaps may be seen as an ongoing source of insecurity and anxiety. A recent study by the Behavioral Neuroscience Institute at the University of Michigan showed that 39% of adults are more anxious today than they were a year ago. Rapid increases in anxiety have not spared any age group, but the study concluded that it is most prevalent in Millennials, particularly females. All of these insights are also applicable for the South African milieu. Worries and fears are a normal part of everyday life, but for some individuals, these become excessive and uncontrollable to the point where efficient daily functioning is jeopardised. In a reasonable amount, anxiety is a natural response to stress, and is considered beneficial in making proactive decisions. Around 82% of caucasians have the anxiety gene (GG allele of SLC6A4 genotype), which was probably a selective advantage in prehistoric times, increasing the chances of survival of more cautious, worrying individuals. Even in modern days this gene facilitates anticipation of problems and leads to more balanced life. Mild or short-term anxiety does not need treatment, as it may be part of our adaptive behaviour that increases our alertness and preparation for new challenges. If prolonged and severe, however, anxiety can cause very tangible physical reactions, including an excessive release of adrenalin into the blood stream that can alter the heart rate and blood pressure. Also, the fear of imminent danger can transform into a full-blown panic attack. In anxious individuals, worrying can also become exceedingly overwhelming – to the extent that the affected person may stop focusing on important areas of their life, such as work, personal relationships, school and family obligations. In such trying situations, people usually opt for the readily available, conventional treatments – anxiolytics and antidepressants. There is a general belief that, in the case of anxiety, the mind is the focal point that needs addressing. Therefore, patients and conventional doctors choose these modalities to solve it. In some cases, it might be necessary but the use of antidepressants and anxiolytics for treating anxiety has seen such a tremendous upsurge that this may be confidently labelled as misuse. 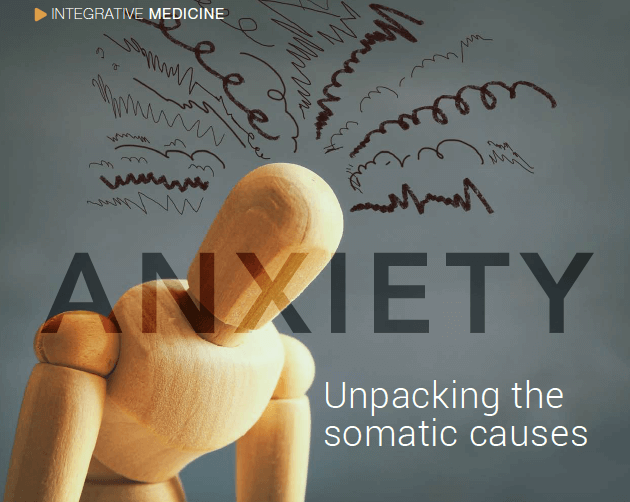 Anxiety can be detected in many different disruptions in the body functions, and could be solved by merely addressing the cause of the disruption. This is usually overlooked by conventional practitioners. In fact, these somatic causes are often found to be the main reason for developing anxiety. Numerous studies (such as Cunninham, 2009; Parcells, 2010; Bloch, 2011) have linked irregularities in hormone levels to anxiety disorder, as well as detoxification problems. Cortisol that gets permanently released during fight or flight response (alongside with adrenalin) can lead to various metabolic dysfunctions, causing irritability, afternoon fatigue, insomnia, lack of motivation and constant worrying. If stress becomes prolonged – irrespective of low or high cortisol levels – symptoms become overwhelming, leading to general anxiety disorder. This is readily detectable and solvable by applying an integrative medical approach. Unbalanced methylation often leads to anxiety, irritability, agitation and brain fog. Methylation, as a part of a detoxification process, is affected by nutritional depletion (low vitamin B12, B6, magnesium, Zn, folate), heavy metal toxicity (such as mercury and aluminum), genetic predisposition, excessive dairy intake, the presence of mould and alfatoxins, and more. Balanced methylation is crucial for the metabolism of many neurotransmitters – adrenalin, norepinephrine, serotonin and GABA – which, if unbalanced, can lead to anxiety. The use of methylation ‘thieves’ such as alcohol and the birth control pill often leads to anxiety. Alcohol is often used to relieve anxiety, without individuals realising that its use will actually perpetuate anxiety. One of the reasons women are more prone to anxiety than men is due to hormone problems. Estrogen dominance is a very common hormonal imbalance, and is accompanied by foggy thinking, difficulty concentrating, tearfulness, mood swings, irritability, depression and anxiety. The belief is that the majority of symptoms are in fact related to progesterone deficiency, which goes with estrogen dominance. Scientists have found that progesterone can decrease anxiety through a mechanism similar to that of anxiolytics – by working on GABA receptors (Frye, 2006). Progesterone is a calming hormone that often brings about instantaneous anxiety relief if applied in estrogen-dominant women. Ongoing stress seems to affect progesterone production in a steroid pathway by ‘stealing’ molecules for its own production. 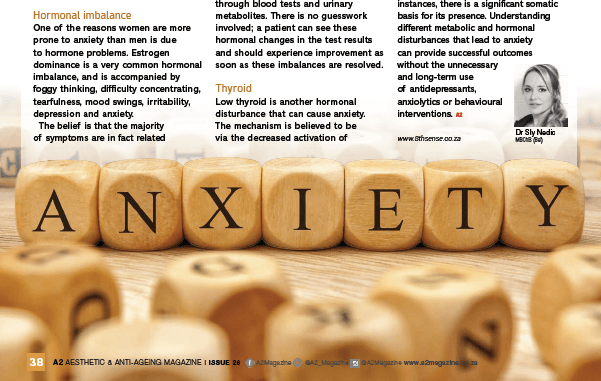 It is virtually impossible to get rid of anxiety if hormones are hugely imbalanced, which is easy to detect through blood tests and urinary metabolites. There is no guesswork involved; a patient can see these hormonal changes in the test results and should experience improvement as soon as these imbalances are resolved. Low thyroid is another hormonal disturbance that can cause anxiety. The mechanism is believed to be via the decreased activation of vitamin B2 (dependent on thyroid hormone), which is essential for folic acid metabolism and directly affects neurotransmitter metabolism. Adding vitamin B2 cannot solve the problem unless the real cause is addressed, such as low thyroid function. There is a high incidence of Hashimoto thyroiditis (an autoimmune disease), which is again more prevalent in women. In order to combat it and indirectly resolve anxiety, an integrative medical approach and lifestyle changes are required. It is clear that anxiety is not only caused by environmental factors. In most instances, there is a significant somatic basis for its presence. Understanding different metabolic and hormonal disturbances that lead to anxiety can provide successful outcomes without the unnecessary and long-term use of antidepressants, anxiolytics or behavioural interventions. 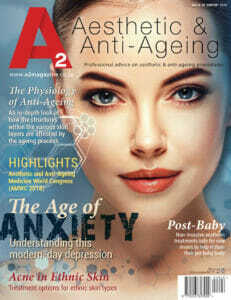 This article was written by Dr Sly Nedic and edited by the A2 team EXCLUSIVELY for the A2 Aesthetic & Anti-Ageing Magazine June 2018 Edition (Issue 26). Dr Sly Nedic MBChB(Bel) is a founder of the 8th Sense Medi-Spa in Sandton, where she passionately combines aesthetic makeovers with anti-ageing medicine, bio-identical hormone replacement therapy and preventative genetic testing. She is a board certified doctor of WOSAAM (World Organization Society of Anti-Ageing Medicine), a member of IHS (International Hormone Society), as well as a member of A4M (American Academy of Anti-Ageing Medicine). Dr Nedic is also an accredited expert for the Thermage® medical procedure, advanced filler and anti-wrinkle injectable techniques, mesotherapy (France), as well as Master courses (Paris).